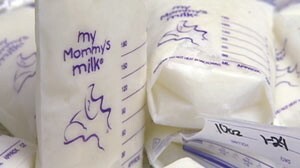 Women all over the country are cashing in on what people are calling a mother's natural liquid gold: human breast milk. A month's supply can cost anywhere from $300 up to $1,200 dollars. In contrast, a month's worth of formula costs an average of $200. For Kamilla Vainshtok and other women like her, the transactions – all done online – can literally "pump up" their income. "Onlythebreast.com is basically a Craigslist for breast milk," Vainshtok told "Good Morning America." "There's buyers and sellers, there's an opportunity for them to meet each other." Vainshtok, 25, is now in the unpaid portion of her maternity leave. Four months after her daughter was born she started producing an abundance of milk. It's been a source of extra money for her. "I Googled breast milk for sale, milk for donation, and I came across onlythebreast.com … within the first week that of my listing, I found a family in Ohio that needed some breast milk and I shipped it out to them," the Brooklyn, N.Y., resident said. Chang asked Vainshtok of if pumping her milk and putting it in the mail didn't "seem weird" to her. "It definitely did seem weird to me but I knew I was helping a family in need," she replied. "Their child wasn't responding well to formula, was having a lot of tummy aches and spit-ups. So I figured if I was able to help this child with breast milk because their mother wasn't able to, then I might as well help them out." It was a win-win situation for both the buyer and Vainshtok. She shipped 300 ounces to the buyer in packed ice. That one-month supply added several hundred dollars to her bank account. Allee Kincaid's excess milk has earned her the family nickname "the dairy cow." "My husband and I just added it up and over the last 9.5 months, we've had about 16,000 ounces," the 26-year-old from Baxter, Iowa, said. Kincaid is a stay-at-home mom. She also found the niche industry online -- which has been fueled by a slew of medical studies which have concluded that breast milk can boost everything from babies' immune systems to their I.Q.s. The money Kincaid earns from mothers who're unable to breast feed themselves helps to pay her bills. "We're a one-income family, my husband works … We actually just bought a new truck that would fit all of us, because my car that I had before was kind of smaller," she said. "So it definitely helped us buy things that we wouldn't be able to afford otherwise." Desiree Espinoza's milk money gave her the wedding of her dreams – including her dress, his tuxedo, the decorations – and even their rings. "In the first month I made close to $1,200. It was quite a bit … ," Espinoza, 22, said. The Phoenix woman has used that money to fill lots of needs: a computer, clothes for her growing daughter, wipes, medicine, "anything else that she needed that we didn't have the money for," she said. But the exchange is not without risk. What little screening there is is all based on the honor system. That allows for so many unknowns -- such as the donor's medical background, said Dr. Judy Goldstein, a pediatrician with Global Pediatrics in Manhattan. Purchasers also don't know if the donor mother has been on drugs. "The skin of the mother could be contaminated … then the breast pump has to be sterile…," Goldstein added. In fact, the U.S. Food and Drug Administration does not recommend buying breast milk on the open market. Such transactions could lead to the transmission of disease. However, it does recommend buying milk from approved milk banks. It may cost more, but the dangers are reduced. "I would never do anything to harm anyone else's baby," Kincaid said. "I feed my baby the same milk that I'm selling … I've had thousands of e-mails, back and forth, between people before they buy milk because they want to make sure it's the best for their baby and I as a mother can understand wanting to be cautious," she added. Ironically, Vainshtok isn't so sure she could overlook the caveats if the tables were turned. "Not from a perfect stranger – maybe if I knew the person, I might be willing to do it. But doing it over the Internet from a perfect stranger, just seems a little bit strange to me. And yet you're the perfect stranger. Absolutely and of course I have all good intentions so I'm definitely doing it the proper way. But you never know," she said.